The Church and the honeybee have a long intertwined history. Early Christians revered the honeybee so much that they have attempt to mimic their fine attributes, they made certain bee products sacred, and they have referenced honeybees in both scripture and architecture. Forsomuch as wee doo marvelously wonder, in considering the first beginning of this substance, too witte, wave tapers, then must we of necessittie commend the originall of Bees; for they are sober in diet and exceeding chaste in engendering. They make closets and found them on the souple wax. They gather of the flowers with their fete, and yet the flowers are not endamaged by it; they bring forth their younge swarms through their mouths, like as Christe proceeded from his Father's mouth; they have fertile chastitie without bearing, which example Christe hath thought good to follow..." (Ransome, 133). Even St. Augustus, the early Christian philosopher and theologian, encouraged monks to think of the chaste bee as a model for those with qualms about their life burdens (Bee-Bible, 17). Beyond just applying honeybees as a model for chastity, some Church leaders even insinuated that the bees where holy because they conscientiously practiced chastity, "Cantimpre, like many other medieval Christians, implied that bees themselves were actually practicing Christian chastity-that their restraint was holy," (Wilson, 82). "Bees are models of social life and activity, in which each class has its duty to perform and performs it exactly- one is almost tempted to say conscientiously- without envy, without rivalry, in the order and position assigned to each with care and love...Ah, if men could and would listen to the lesson of the bees: if each one knew how to do his daily duty with order and love at the post assigned to him by Providence; if everyone knew how to enjoy, love, and use in the intimate harmony of the domestic hearth the little treasures accumulated away from home during his working day: if men, with delicacy, and to speak humanly, with elegance, and also, to speak as a Christian, with charity in their dealings with their fellow men, would only profit from the truth and the beauty conceived in their minds, from the nobility and goodness carried about in the intimate depths of their hearts, without offending by indiscretion and stupidity, without soiling the purity of their thought and their love, if they only knew how to assimilate without jealousy and pride the riches acquired by contact with their brothers and to develop them in their turn by reflection and the work of their own minds and hearts; if, in a word, they learned to do by intelligence and wisdom what bees do by instinct--how much better the world would bee (Pius XII, CatholicCulture.org). Besides the use of the honeybees products in the Church, the bee as a symbol was used to garner power and draw noble connections by a would be pope. Maffeo Barberini, a cardinal, was from a wealthy Florentine family whose coat of arms had consisted of three black horseflies (Wilson, 130). Barberini cunningly changed the horseflies to honeybees in order to seem more prestigious and noble in order to get elected as the pope. 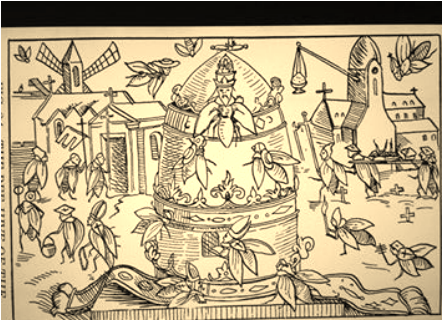 Later, as Pope Urban VIII he scattered the imagery of his bees throughout Rome, which further connected the legacy of the Church and honeybees (Wilson, 131). From the Piazza Barberini to St. Peter's basilica the honey-bees roots with Catholicism strengthened and they "remained the official symbol of the papacy well into the nineteenth century" (Wilson, 131). The images below and to the right are examples of the Barberini bees. 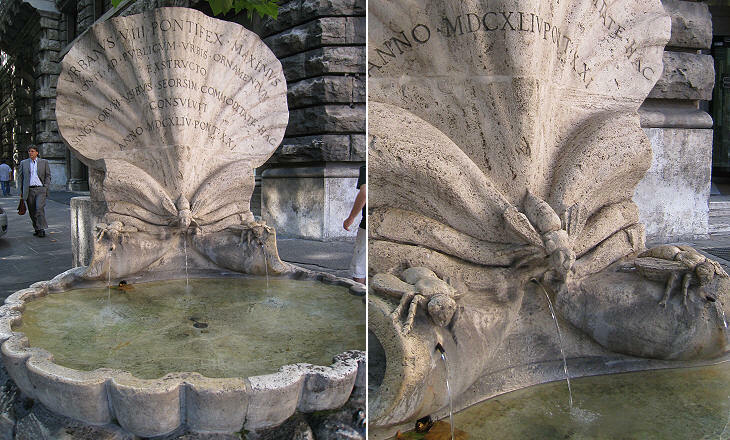 The image below is the Fountain of the Bees, and the image to right are the columns from St. Peter's Basilica both of which are adorned with honeybees. The specific action of Beekeeping was done primarily by the monks of the Church, and there were even monks and nuns whose entire position was to work with the bees (Beekeeper's Bible, 48). The products of the honeybee, namely honey and wax, were utilized by the Church for particular practices. Wax and honey were sacred substances for the early Church (Wilson, 129). Beeswax was the foremost contribution to Catholic culture. The wax was used for candle making, and these candles were symbols of Christ, "The wick denoted the soul and mortality of Christ, the light the divine person of the Saviour," (Ransome, 134). Beeswax candles were the preferred and only method for illumination of Catholic Churches, a practice which survived until the twentieth century when the requirement was ended by the pope (Beekeeper's Bible, 49). These beeswax candles were preferred because they burned cleaner and better than the alternatives of the time, primarily animal fat tallow candles. The Church chose to use the pure beeswax to the polluted alternatives, as the representation of light and Christ. Beyond the candle as a symbol for Christ, it also represented the most holy chastity of Mary the mother of Christ, "Like Mary, the wax producing bees possessed a mystical combination of fecundity and virginity. Bees 'produce posterity, rejoice in offspring, yet retain their virginity', says the hymn that is sung on Holy Saturday in honour of the paschal candle," (Wilson, 83). Honey was also used in certain rites, and ceremonies of the Church. Early Christian sacraments such as baptism and communion used combinations of milk and honey to further connect man with their divine savior (Ransome, 259). Honey was even an essential diet ingredient of St. John the Baptist (Adress on Bees, Catholicculture.org). References to honey and bees are frequently found within the bible. The honeybee and honey were highly valued and were used in scripture, liturgy, and they even have Saints. In the Bible (we used The New American Bible), honey is used as a reference tool to explain gluttony, pride, strength of character, health, and even to describe a promised land. The usage of honey in the bible exhibits how how bees and honey where crucial to early Christian society, they where used to describe holy, good, and righteous actions and places. Therefore if equated to these positive and important principles honey, bees, and wax must have held, to some degree, a similar societal connotation. Gen. 43:11 (NAB): "Their father Israel then told them: "if it must be so, then do this: Put some of the land's best products in your baggage and take them down to the man as gifts: some balm and honey...". Exod. 3:8 (NAB): "Therefore I have come down to rescue them from the hands of the Egyptians and lead them out of that land into a good and spacious land, a land flowing with milk and honey, the country of the Cannaanites, Hittites, Amorites, Perizzites, Hivites and Jebusites." Ezek.16:13-14 (NAB): "Thus you were adorned with gold and silver; your garments were of one linen, silk, and embroidered cloth. Fine flour, honey, and oil were your food. You were exceedingly beautiful with the dignity of a queen. You were renowned among the nations for your beauty, perfect as it was, because of my splendor which I had bestowed on you, says the Lord God." Prov. 16:24 (NAB): "Pleasing words are a honeycomb, sweet to the taste and healthful to the body." Prov. 25:27(NAB): "To eat too much honey is not good; nor to seek honor after honor." Isa. 7:15 (NAB): "He shall be living on cuds and honey by the time he learns to reject the bad and choose the good." Beyond their use in the Bible honey, and bees sacred nature is further cemented in Liturgy. According to an address given by Pope Pius XII, "Alitur enim liquantibus cerise, quas in substantiam pretiosae hujus lampadis apis mater eduxit," which translates to, "For it is nourished by the melting wax, which the mother bee produced for the substance of this precious light," (Pius XII, Address on Bees). This phrase is sung during Holy Saturday in reference to the holy light of the candle. Although the usage of honeybee is rapidly declining, there are still traces of it's ancestral importance. It's use in the bible remains to this day, and it is still used in symbology by the popes. 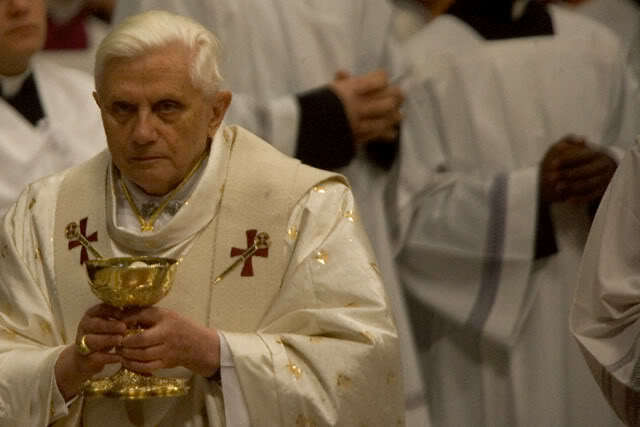 Below is an image of Pope Benedict XVI holding Mass in a silk chasuble adorned with silver and gold bees. "The bee was a sacred being because it made sacred wax; and wax was holy because the bee was holy." (Wilson, 47).